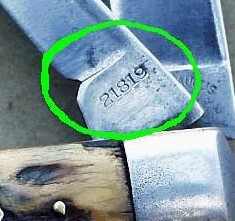 On Cattaraugus Knives, The the last digit of the pattern number indicates the type of material used to make up the handle. For example: the pattern # 21819 tells you that the knife is made of bone because the number 9 is used by the company to identify bone handles. The following is a reference of all of the handle materials used by Cattaraugus throughout history. You will also find pictures and short descriptions of the more common handle materials. Click on the pictures if you would like to see them in more detail. Celluloid is a petroleum based material that is often colored and/or impregnated with vivid colors. White celluloid is simply died white…. Perhaps to imitate ivory? Knives made of this material should be kept separate from other knives and checked for problem spots more often because the material emits fumes that will promote rust. This materials was made from the inner shell of oysters. Small thin pieces of the shells were bonded together to form large sheets that are then shaped into handles. Celluloid is a petroleum based material that is easily molded into handle shapes and impregnated with colors that allow for a large number of handle colors and designs. Knives made of this material should be kept separate from other knives and checked for problem spots more often because the material emits fumes that will promote rust. Stag handles are made from the antlers of deer. It is very popular to collectors because of its beauty, durability, and the fact that no two handles look exactly alike. The material most often comes from the outer cut from the antlers of Sambar Deer from India. This is a dark, almost black colored wood from Africa. It is very hard is extremely fine grained. This is a reddish brown colored wood that is very hard and has a fine grain. It comes from Central America. Bone handles come from the shinbone of cattle. 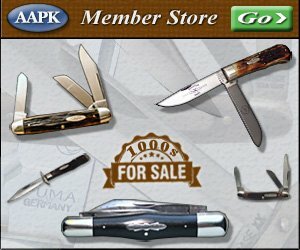 Over the years, it has been the most used material in making knife handles. It allows for numerous variations because it can be died any color, and jigged in many different ways. It was originally used to imitate genuine stag. This is where the name bone stag came from.